Update: Via Zero-G News, multiple close camera views of the failure and explosion from photographers who had remote rigs set up near the launch pad, plus further details on the launch abort. 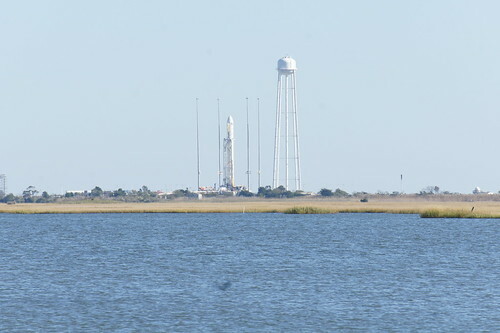 The Antares vehicle carring Cygnus CRS Orb-3, Orbital’s third cargo resupply mission to the ISS, suffered a failure shortly after liftoff and fell back to the pad in a fiery explosion. This was an uncrewed cargo capsule, and no one was injured. I was at the first launch of the Antares rocket last year. That went well. This launch did not go so well, and there’s some speculation that the old Soviet engines powering the vehicle may have been a factor. Collection of more Antares launch failure videos from Spaceflight 101. News stories from Jeff Foust for Space News, and Phil Plait for Slate. First person accounts from the NASA viewing site by Stephen Clark, Doug Mohney and Ken Kremer. Official statements from NASA and Orbital Sciences. Failures happen in rocket engineering. Orbital and NASA will learn from this and move forward.